Cassie: As a part of my Back to Art Teacherin’ routine, every school year in late July, early August, I make a new dress. 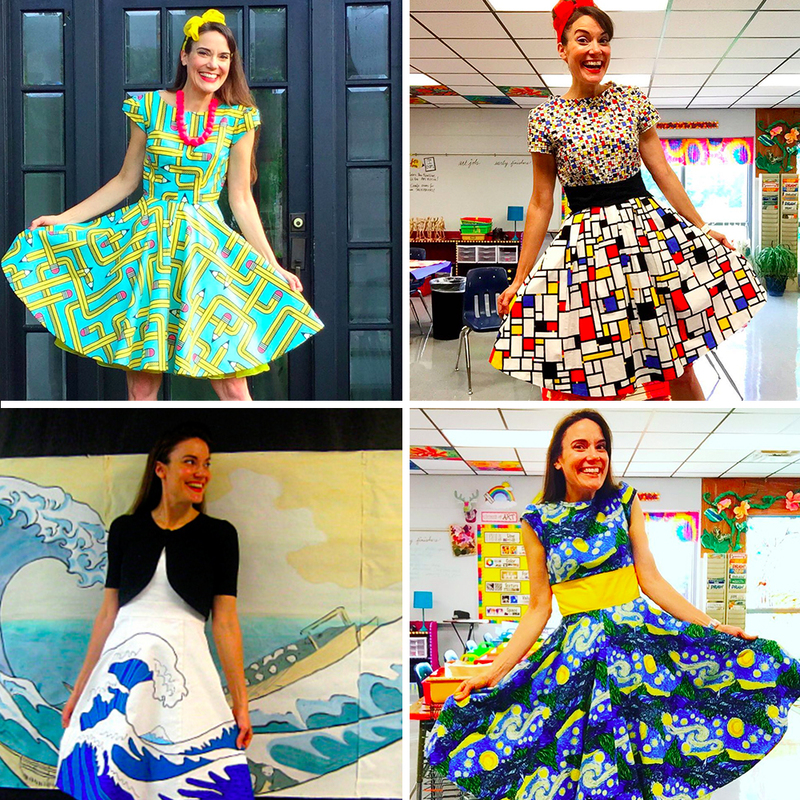 I actually kinda sorta sew A LOT of dresses to wear while teaching all things art. 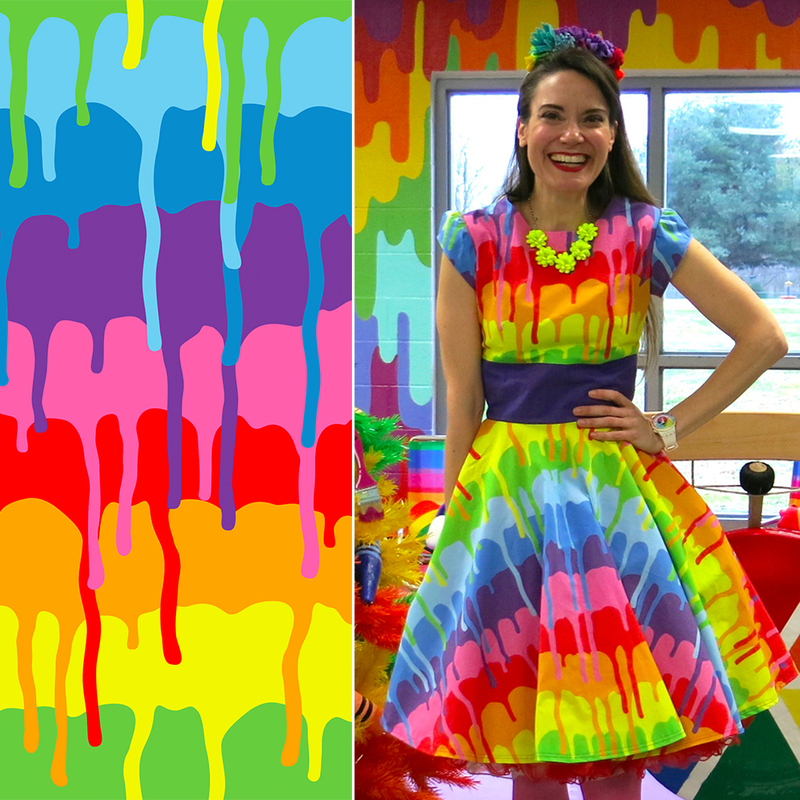 I’ve got a light-up van Gogh’s Starry Night dress, a Munch’s The Scream dress, an Andy Warhol Campbell’s Soup Can dress…I even have a dress made from fabric that the kids drew self-portraits all over. You could call me the Miss Frizzle of Art Teacherin’ (I’ve been called worse). It’s what I do because it combines the things I love: creating, teaching and art. 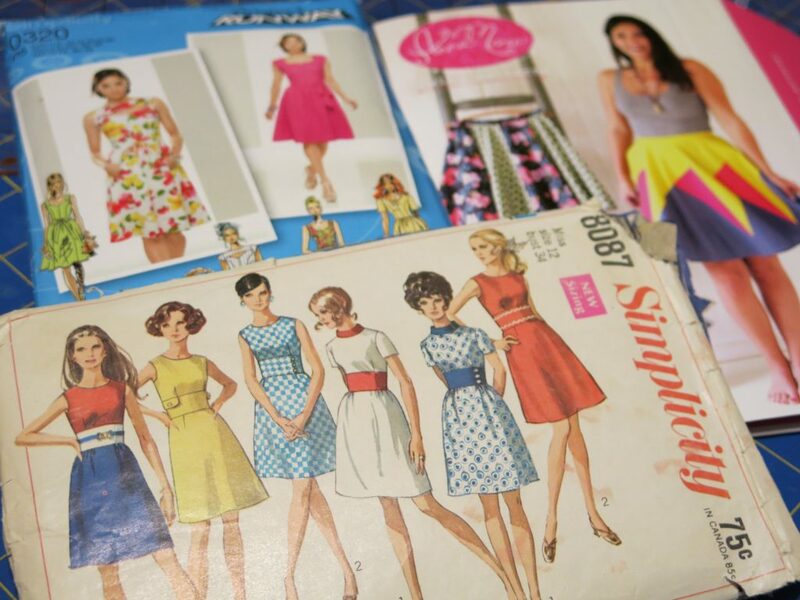 A peek into Cassie’s handmade wardrobe, including Pencil Maze Pattern Classic by seasonofvictory! At the start of this school year, I knew I wanted a really bold and bright print for my dress. 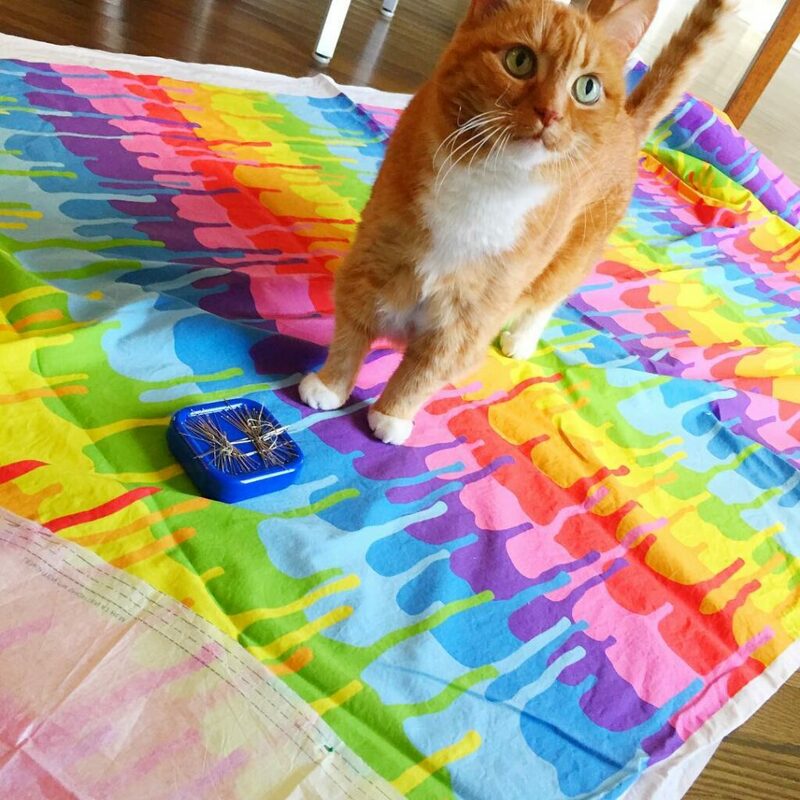 After searching Spoonflower for just a hot minute, I found the fabric of my dreams: this paint-drippy, rainbow-trippy number – aka Rainbow Paint by dmitriylo. Nothing says Art Teacher like this melted rainbow! I immediately threw three yards of Basic Cotton Ultra into my shopping cart and hit buy. Having sewn many dresses for myself, I know what feels the most flattering for me: a fit and flair. 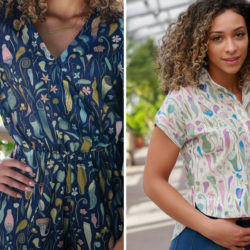 Nearly each dress I make is a combination of these three patterns: a vintage Simplicity 8087 because I love the bodice and waistband; the Anna Maria Horner circle skirt pattern; and Simplicity 0320 for the cap sleeves and the pocket pattern. Sometimes I venture down other avenues when sewing but this combo is my solid standby. I know you’d never guess this by my youthful complexion (ahem) but I’ve been teaching art to elementary aged kiddos for close to 20 years. I’ve had the good fortune to have a huge art room for the last 15. Having been in the same space for a long time, I’ve grown a little tired of staring at the same posters, decorations and, well, junk. While working on my dress, I decided I wanted a change. Something brighter and happier. I wasn’t sure what that change was going to be but I was excited by the idea. 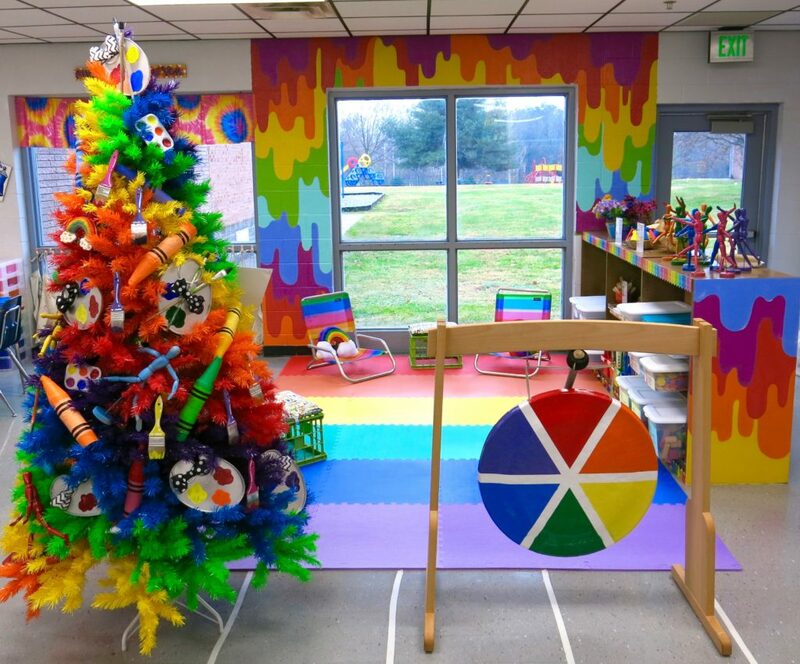 It was then that I got the most amazing addition to my art room: a Rainbow Tree! 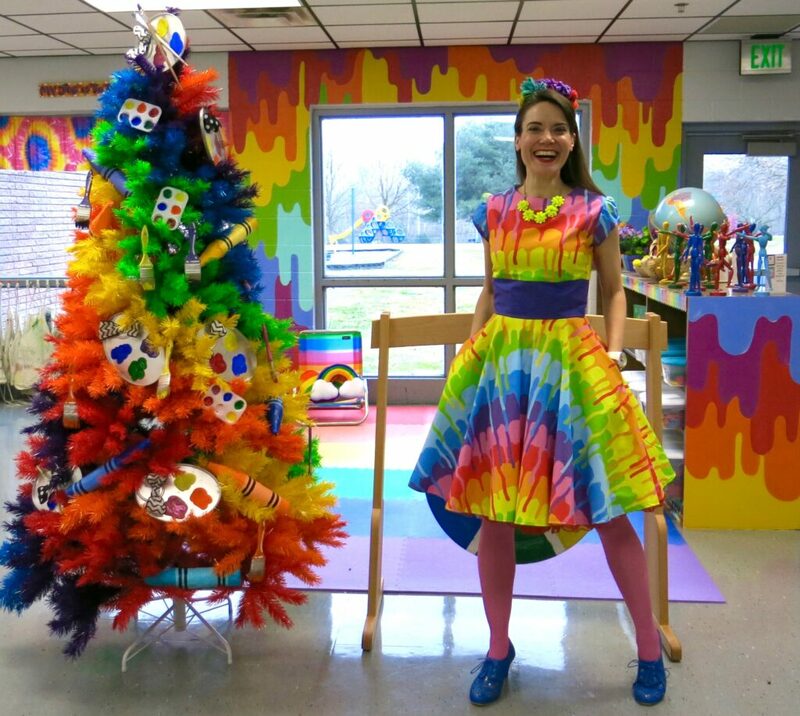 Once that tree entered my life, it was game over for my drab and tired art room. I tore down the old decorations, cleaned the painting from my window and decided to paint my walls…just like the fabric of my dress. In fact, I took a swatch of my dress to the local hardware store and asked for matching cans of paint. Without asking permission, I attacked my school walls one Sunday while everyone was out of the building. Having lived in the South the last 2 decades, I’ve learned that the Southern way is not to ask permission but for forgiveness when busted. Thankfully, my principals are huge fans of my rainbow makeover. I mean, how could they not be?! But the biggest fans are the kids. 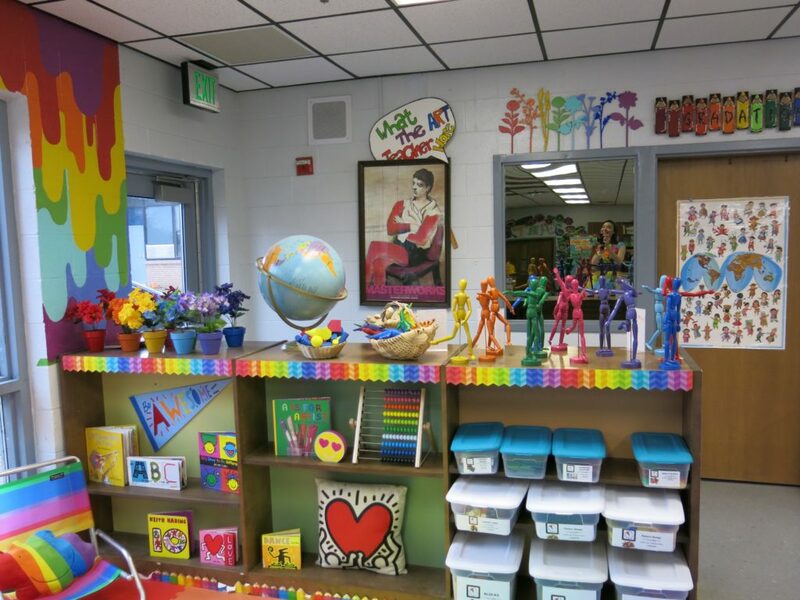 They’ve dubbed that area of the art room The Rainbow Lounge and love to go there to build, read and draw. “This place is paradise!” I overheard one say the other day. My heart may have exploded a little bit. 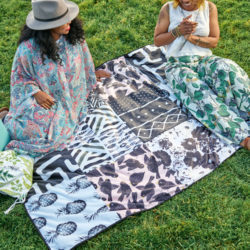 I had so much fun stitching up this dress that inspired a room makeover…but I gotta be honest: I’m a little afraid to lurk on Spoonflower anytime soon. A new amazing fabric will have me redoing another portion of my art room if I’m not careful! What do you remember most about your art teacher? Leave us a comment below to share your favorite memory! 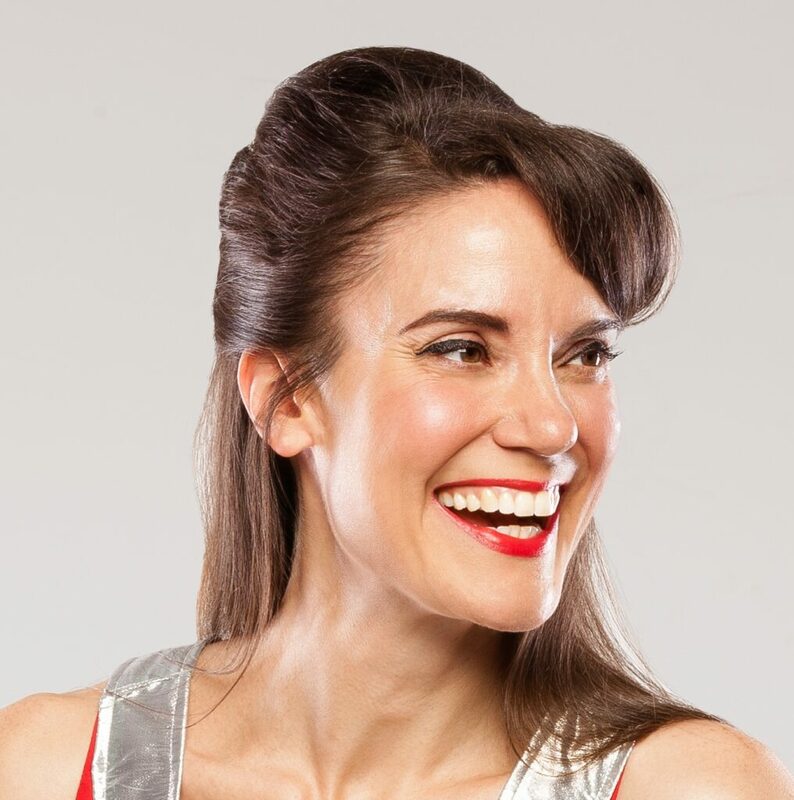 Originally from the cornfields of Indiana, Cassie Stephens moved to Nashville, Tennessee on a whim after being offered a teaching gig at an elementary school nearly 20 years ago. 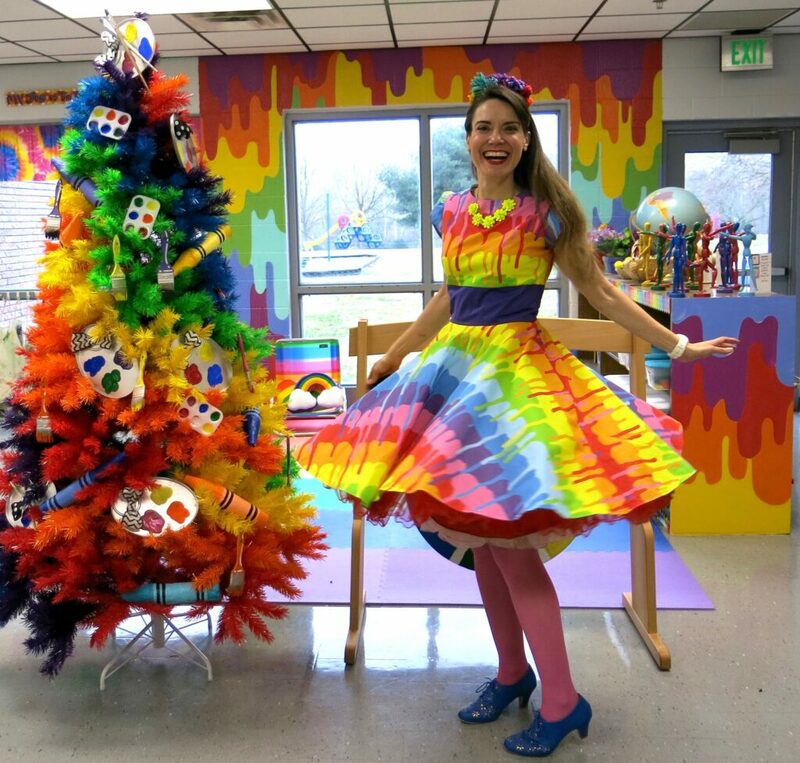 Not long ago, she taught herself to sew and has been wearing her wild and crazy handmade ensembles to school since. Her students often times don’t know what to think and have taken to simply calling her the Crazy Art Teacher. 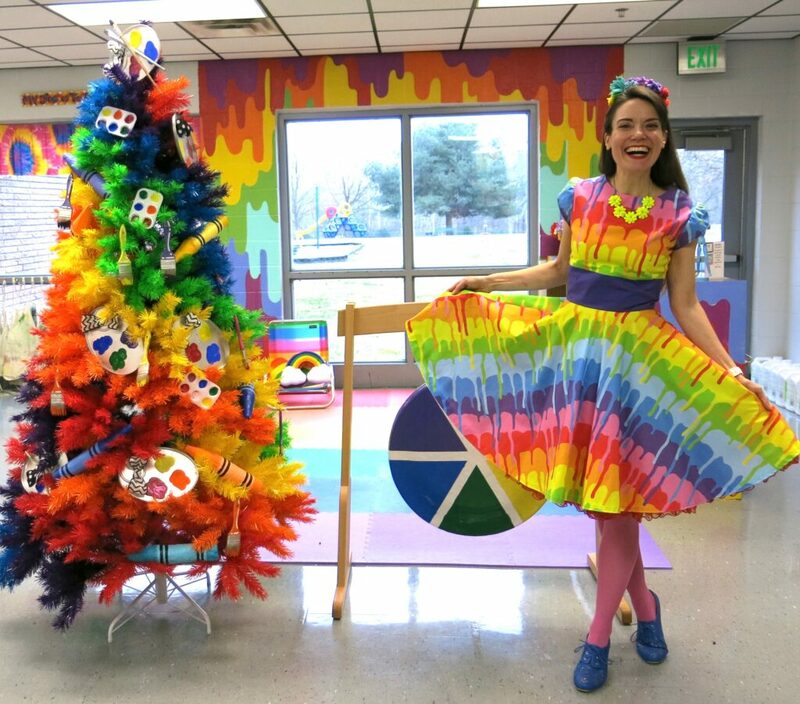 Follow Cassie’s classroom transformations and get a closer look at her me-made wardrobe on Instagram! During a “back -to -school night” in high school, my art teacher told my dad I should go on in art. I never forgot that comment. Now, as an art teacher myself, I try to say the same thing to parents about their children. I believe everyone is an artist, in one form or another, it’s important to share that belief as often as possible. Like I tell my students, your life is your masterpiece! Having an art teacher like you would have been heaven! Your students are so lucky! I do remember my art teachers because i always loved art and that was my favorite class. I can vividly remember working on many different projects throughout the years and how proud i was of so many of them. I am still passionate about sewing and creating just like you. I love Cassie’s blog. Love her enthusiasm, her colours, her ideas. Wish we had had an art teacher like her when I was at school, 50 years ago. This is fantastic!!! I started out as an art teacher and we would have been best friends! 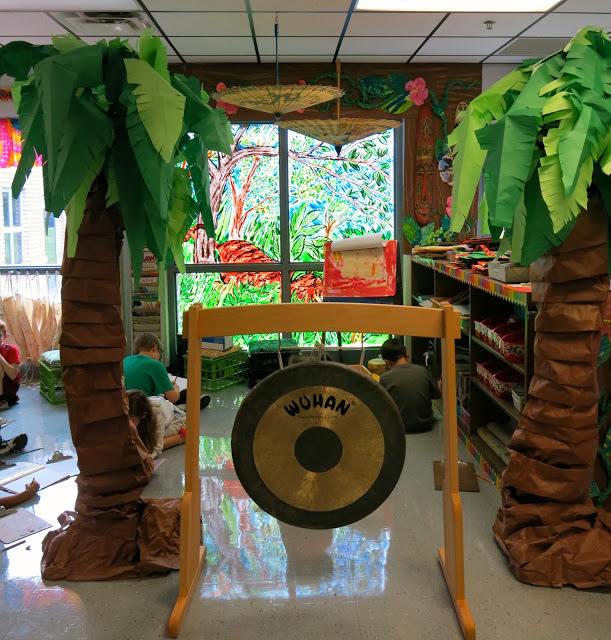 I used to create “art installations” in the back of my room with my students and play music during class changes —we’d invite all student and faculty to pop in and see the latest fun art room creation! But I never thought of dressing up in art. That’s fantastic!!! Cassie is so creative and inspiring! We’re glad you enjoyed her post. It sounds like you are equally as creative! This is so amazing and inspiring! I loved art despite our teacher seeming very distant and uninterested, because I had been brought up at home to love art. Cassie who seems so passionate and alive! Her students are very fortunate to have such an engaged and creatively inpsired teacher with wonderful ideas!